Our iLok enabled applications EdiCue, EdiPrompt, EdiLoad and EdiChart use iLok licenses for authorization. The license can either be stored locally on an iLok USB Smart Key, or accessed via the local network using a Sharable License (see below). iLok Cloud is currently not supported. iLoks are portable USB devices that can contain licenses from multiple manufactures. For example, an iLok containing an EdiCue license can be used to authorize EdiCue running on a Mac or PC – wherever you go. Licenses can be stored on either an original, 2nd or 3rd generation iLok, depending on the application. Currently EdiPrompt, EdiLoad and EdiChart require a 2nd or 3rd generation iLok, but in the future all of our iLok applications will require a 2nd or 3rd generation iLok to run. ILoks can be purchased from www.ilok.com and most pro audio dealers. To utilise this system, ensure you have installed the latest PACE ‘License Support’ software. This installs the iLok License Manager application as well as drivers that our applications require to run. Download the latest Mac/Win License Support installer from www.ilok.com. Note: The PACE License Support software is automatically installed during a Pro Tools installation. If you have redeemed a trial license and the above window continues to appear, open the iLok License Manager application (see below) and check if the trial license needs to be moved from your iLok account to a physical iLok. To extend a trial, contact us and provide your iLok User ID (not the physical iLok number). Once the PACE 'License Support' software is installed, the iLok License Manager application can be found in the Applications (Mac)/Program Files (PC) folder. It can be used to redeem a license that is sent as an 'activation code', move a license from your iLok account to a physical iLok, or move a license from one physical iLok to another. If we have deposited a license into your iLok account, you will need to move it to a physical iLok in order for one of our applications to see it and allow it to run. For more information, see the iLok.com iLok License Manager page. All of our iLok enabled applications* have the ability to use a special type of license that can be shared across a local network. Sharable licenses are configured using iLok License Manager on a network computer to act as a server and share these licenses to other (client) computers on the network. Only sharable licenses with more than one seat assigned can be shared on a network and are stored on an a physical iLok connected to the server. Connecting a client computer to a license server is simplified using Zero Configuration standards. Varied levels of privacy are supported so that the license network can be made private or public (to the local network). Sharable licenses are ideal for classrooms and large businesses that require a robust license sharing system. Sharable licenses also require a perpetual license for iLok License Server to be present on the server iLok. This license provides the option to distribute sharable licenses from any vendor using iLok License Manager, and can be purchased from our web store. For more information see the iLok License Server Administrators Guide, and for license users, see the iLok License Manager Manual. 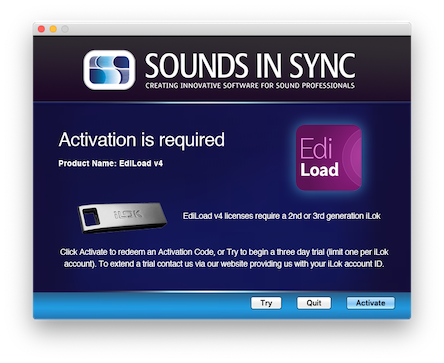 EDI software can be purchased from the Sounds In Sync webstore. Following purchase, an Activation Code is displayed and emailed to the address provided. 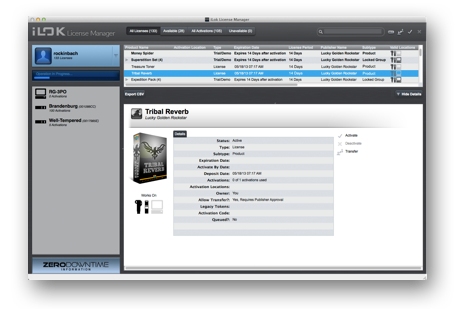 Click the activation link to redeem the license at www.ilok.com or open iLok License Manager, select Licenses > Redeem Activation Code and paste the code into one of the boxes. The license can then be transferred onto a physical iLok to authorize your software. Note: The above can be performed on any Mac or PC connected to the internet. Want to buy one of our apps but can't afford a full license now? Click here for information on how you can 'rent to own' a license.